Oxalis, also known as shamrock plant, is a genus of flowering plants that consists of over 900 different species native to all regions of the world, with the exception of polar climates. Oxalis are perennials when grown indoors, and go through a dormant period during the summer when the plant rests and prepares for growth and flowering in the late winter and spring. Oxalis plants form flowers which can be red, white, pink or yellow in coloration, and their foliage resembles that of the shamrock. Oxalis is easily grown indoors with infrequent maintenance. Plant oxalis bulbs in a medium sized container to allow plenty of room for growth. Fill the planter with a soil mixture made up of one part coarse sand and two parts potting soil. Dig a small hole in the soil and insert the bulb with the pointed side up. Cover the bulb with soil and water thoroughly to collapse any air pockets. Place the planter in a bright window that receives plenty of sunlight throughout the day. Ensure the temperature is between 70 and 75 degrees Fahrenheit during the day and no lower than 50 degrees Fahrenheit at night. Water oxalis once per week to allow the soil to dry slightly between applications. Continue this watering routine until the foliage begins to die back, usually during summer. This is when the plant enters its dormant period, which will last for 2 to 3 months. Keep oxalis in a cool, dry location during dormancy until growth begins again in winter. 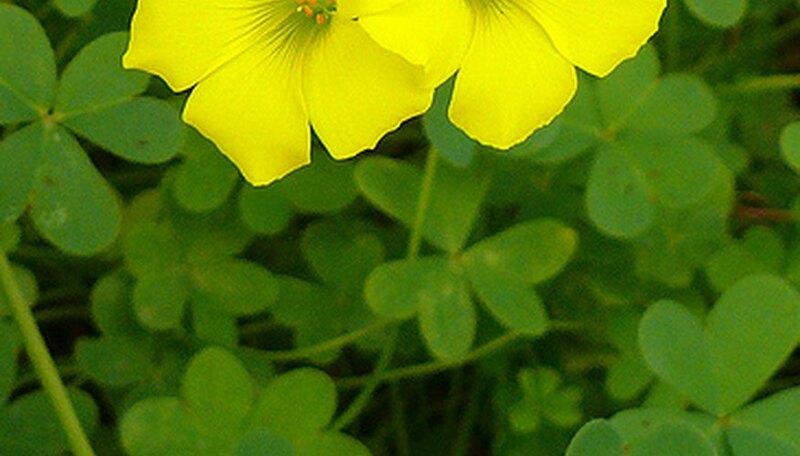 Feed oxalis plants once per month using a balanced 10-10-10 NPK fertilizer. Water thoroughly both before and after application to prevent root burn. Do not fertilize during the plant's dormant period. Follow the instructions on the package for proper application and dosage. Remove any leaves or flowers once they begin to fade and die. This will direct the nutrients in the plant to focus on forming new flowers and foliage, instead of trying to save the old ones. This will also prevent fungal infestations that take advantage of weak leaves. Simply pinch off any fading leaves or flowers as close to the stem as possible using your fingers. Oxalis plants can be allowed to grow outside during the spring and fall, as long as the temperature stays in the prescribed range. If the oxalis begins to grow tall, it is not receiving enough sunlight and should be moved to a different location.